U.S. President Donald Trump has been roundly attacked for his rocky performance at the annual NATO summit, and his meeting with Russian President Vladimir Putin in Helsinki immediately following. In the face of what some consider a resurgent Russian threat, many question Trump’s commitment to NATO’s Article 5. A better barometer of NATO’s health, however, comes not from Washington, but Berlin: Is Germany committed to meeting its Article 3 commitments? Having lived in Germany for a total of six years throughout my military career, it is important to note from the outset that I greatly admire the Germans and think very highly of them. My first exposure to Germany came in the late ’80s and early ’90s during the Cold War, and I participated in major nationwide field exercises such as REFORGER. As a member of the 2nd Armored Cavalry Regiment, I conducted border patrol duties between West Germany and East Germany with live ammunition. We were the first line of defense against the possibility that any of the 50,000 tanks of the Warsaw Pact nations could come flooding across the Fulda Gap to invade western Europe. I saw firsthand how the German government and its citizens behaved when they viewed a legitimate military threat from the Russian-dominated USSR. West Germany spent 2.4 percent of its gross domestic product on defense in 1989. Its soldiers were well trained, its tanks and aircraft were well maintained, and — along with the rest of NATO — posed a strong deterrent from Soviet attack. The Bundeswehr was then fully capable of fulfilling its requirement to adequately defend itself — its Article 3 obligations under the NATO charter — as well as meeting its Article 5 responsibilities to do its part in defending other alliance members. German politicians during the Cold War had little resistance from citizens in allocating meaningful amounts of its GDP for defense because a majority of Germans correctly recognized it was necessary. Today, however, represents a sharp contrast to the days of the Cold War and exposes Berlin’s true assessment of the threat it faces. What can’t be ignored: The world changed dramatically after the end of the Cold War. NATO in general and Germany in particularly didn’t. When I arrived in Germany with the 2nd ACR in 1989, The National Interest reported that then-West Germany’s defense spending “was 2.27 percent of GDP, and the Bundeswehr [German armed forces] had 469,000 active-duty military personnel and 621 combat aircraft.” Today, there are fewer than 180,000 troops, and according to a Business Insider report, the numbers of major combat equipment — such as tanks and fighter jets — is less than half what it was in 1989. The lower numbers, however, aren’t the primary cause of concern. While many German legislators voice concern over the shocking lack of military readiness, they remain unwilling to make the necessary investments, considering the mark of 2 percent of GDP for defense spending to be merely a “target” and not an ironclad necessity. Their unwillingness to increase defense spending exposes two key truths. First, Germany does not consider Russia an existential threat today. No nation or peoples on the Earth that has abundant resources will fail to defend against a threat they believe may one day attack and defeat them. As it graphically proved during the Cold War, Germany will spend considerable amounts on its defense if it believes its freedom is genuinely threatened. Second, while not viewing Moscow as a present and major threat, Berlin nevertheless doesn’t consider Putin’s Russia as benign. They have chosen to fund their defense to a minimal level in the belief — apparently correctly — that they can count on the U.S. to be their “insurance policy” in the event a military threat does arise from the east. Berlin is content to allow U.S. military personnel on their territory to buttress their rump military capabilities. So long as Washington allows this dependency to continue, the German government is very unlikely to ever reach the 2 percent figure. As such, Germany is currently not in compliance with its Article 3 commitments and could offer only tepid support if called upon to meet Article 5. 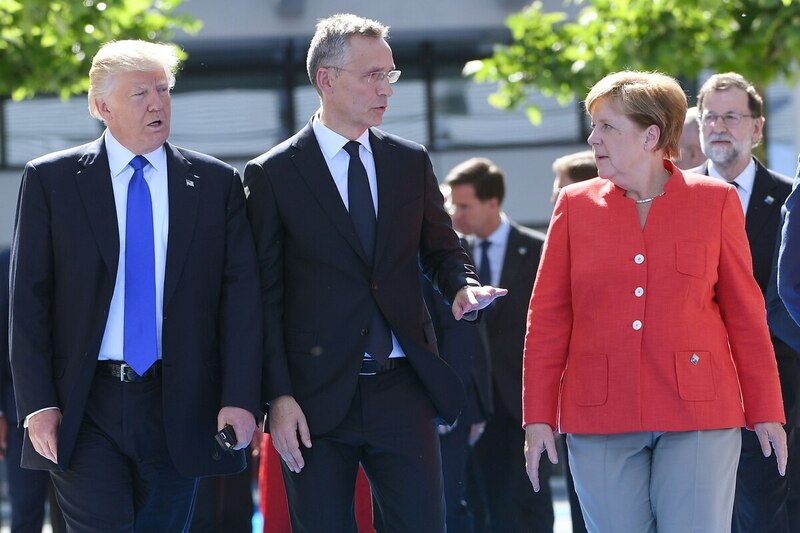 However discourteous Trump publicly treated NATO leaders at the summit, the fact remains that the president had a point: It is unfair to American taxpayers and U.S. military personnel to permanently provide for the security of the richest country in Europe when they have the resources and personnel of their own to meet the need — but choose not to. The issue isn’t to abandon Germany, but to rationally and respectfully insist that they meet their Article 3 obligations to the same standard the U.S. does. If the truth is that German politicians and citizens don’t believe their security is genuinely threatened and that current levels of defense spending are appropriate for the threat they face, then it is appropriate for the U.S. to conform to the same standard and reduce our efforts accordingly. Daniel L. Davis is a senior fellow for Defense Priorities and a former lieutenant colonel in the U.S. Army who retired in 2015 after 21 years, including four combat deployments. You can follow him on Twitter at @DanielLDavis1.